The opinions of a variety of stakeholders, including members of the Board of Trustees, administration, faculty, staff, and students of the College, were sought during the planning process of the Strategic Directions. The Strategic Directions include the College vision, mission, values and the strategic goals. Simply, the Strategic Directions indicate where the College is now, where the College is going, and the plan to get there. 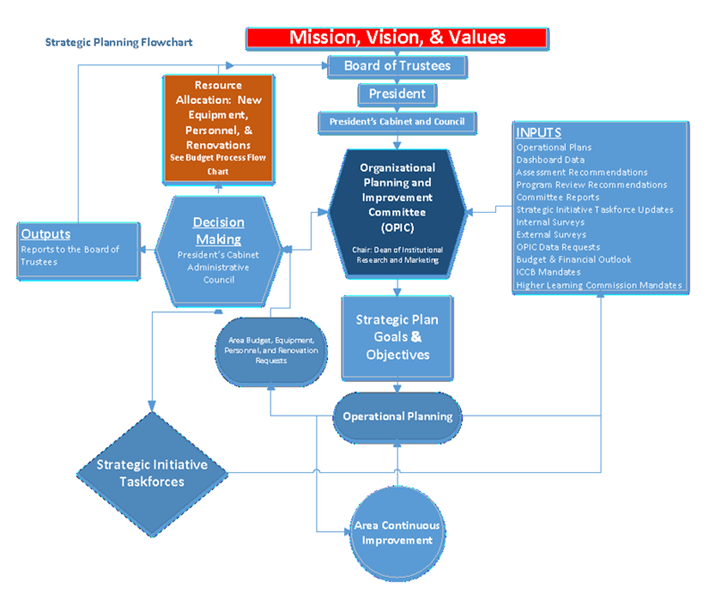 The Operational Plan is created from the Strategic Directions and is a planning document that allows college departments to use the Strategic Plan as a way to focus their own annual plans, create departmental goals, and make budgetary requests. The VP of Research, Planning, and Information Affairsis responsible for overseeing the planning and implementation of the Strategic Directions and the Operational Plans. The VP also chairs the Organizational Planning and Improvement Committee (OPIC) which is made up of faculty, staff, administrators, and students. OPIC helps develop the Strategic Goals and Objectives, oversees their implementation and makes recommendations (including budgetary) to the College President and the Board of Trustees. Planning timelines of internal processes creates an annual planning and reporting cycle that the College uses to evaluate the progress toward the strategic goals, refine them if necessary, and make budgetary decisions. The College’s accrediting body (the Higher Learning Commission) and the Illinois Board of Higher Education expect that the strategic directions will be created through processes that include all stakeholders. The College should also regularly evaluate community needs in order to have effective plans in place to respond to future challenges and opportunities. Sauk's strategic plan also recognizes the College's role as a part of the Illinois Community College System governed by the Illinois Community College Board.